Google today announced Google Play game services for iOS and Android at its Google IO conference keynote in San Francisco, a service it helps will serve as the core building block for creating a gaming platform for the next generation of games. Hugo Barra, Google's vice president of Android product management, took the stage during the Google IO keynote to show off the new set of gaming-specific Google APIs. "Let's talk about gaming," Barra said. 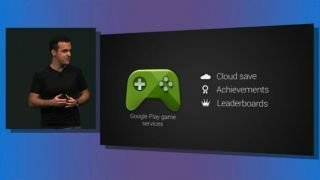 Google Play game services includes cloud saves that work across devices, achievements, and leaderboards that use Google+ circles. As with everything in our device-a-day world, Google Play game services is all about increasing social aspects while boosting power. Achievements are designed to increase engagement and promote different styles of play (whatever that means in application), while leaderboards use Google+ circles to track high scores among networks. Barra showed off leaderboard functionality in the Android version of the popular indie game World of Goo. He also revealed that Google Play game services will include matchmaking services to facilitate multiplayer gaming, but failed to actually show it in motion after network difficulties besieged his portion of the keynote. Players will be able to have up to four simultaneous friends or auto-matched players in one game session, though Google promised support for more players will come soon. Google Play game services will be available starting today through and Android SDK, while a native iOS SKD for iPhone and iPad is also ready to go.